A Worthing dog owner has been ordered to pay more than £700 after admitting she regularly used a children’s playground to exercise her pet, a council spokesman has said. Karin Tinsley, of Coniston Road, Worthing, was issued with a £50 ‘on the spot fine’ by the council after she was spotted walking her dog in the dedicated area for children in Palatine Park, a Worthing Borough Council spokesman said. 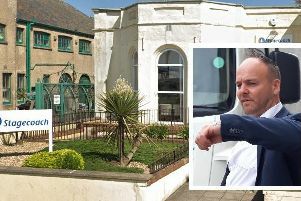 When she did not pay the Fixed Penalty Notice and ignored reminders, Worthing Borough Council had no option but to take the case to Magistrates’ Court, the spokesman said. At a hearing on Friday last week at Worthing Magistrates’ Court, the resident pleaded guilty to two offences, confirmed the spokesman. Mrs Tinsley received a £100 fine for an offence on 3 May 2018 and a £100 fine for an offence on 24 May 2018, the spokesman said. A victim surcharge of £30 and costs of £500 brought the total amount to £730, according to the council. Councillor Val Turner, Worthing Borough Council’s Executive Member for Health and Wellbeing, said: “We know that the vast majority of dog owners are caring and responsible. “But this case shows that when there are repeated cases of people breaching our dog control orders then we will act.